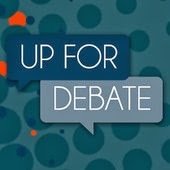 This past Saturday morning I appeared on the show Up for Debate through Moody Radio. The topic of the day was when one should or shouldn't leave one's church, thanks to this blog post that I wrote back in January. You can access the recording of the program on their website under the "Past Programs" tab; just find the March 29th show. It's also available through iTunes. All in all, I really enjoyed it. I found the host, Julie Roys and my fellow guest Chuck Betters to be very cordial and hospitable, and it was a good discussion. It was actually amazing how quickly the hour went. I could have said a lot more about the subject given more time. Except I said "Um…" a lot. I didn't realize I was doing it at the time. Then I listened to it again and started yelling at Radio Me to knock it off. I mean, come on, man. Just make your point already. Sheesh. Anyway, I was glad for the opportunity and the experience. I'd love to do something like it again.